Having finally seen Her, I'm surprised to find the distinct lack of chatter this film is generating among genre fans. This film takes an existential look at the (potential? inevitable?) singularity, and shows viewers the future of video gaming. Be warned, there be spoilers here (although not about the main plot). Her is advertised as a quirky dramedy (apparently that is a word) in which Joaquin Phoenix plays a non-social loner who distances himself from others and has difficulty with human emotions (I know, what a stretch) who falls in love with an unbelievably attractive character played by Scarlett Johansson (also a stretch), who never actually appears on film, because she essentially plays the voice of a super-advanced Siri (okay, ScarJo being hot without being seen, this is new). In reality, however, this is a film about the singularity, with the romantic main plot serving as the MacGuffin moving audiences along with the development of artificial intelligence. Kind of the reverse of another film by director Spike Jonze, I'm Here, which uses a post-singularity world as the setting for a quirky dramedy (feels weird, using that word). How will artificial intelligences react to us? How will we treat them? Will they fit into society? What does it mean to be a "person"? Is a person worth being? How fast will artificial intelligences evolve, and how will that affect mankind? All these questions are addressed as Phoenix's Theodore tries to find love. The film is not shy about its journey into an existentialist quagmire. It even provides an interesting cameo by 1960s free-thinker Alan Watts. Because existentialism is such a central theme of the movie, legal questions about artificial intelligence and IP-protection are not really addressed in the film. Interestingly, just as I found myself thinking "what would the courts say about-?" a lawyer character was introduced to the cast and she casually accepted Johansson's Samantha without a second thought, as if to say "yes, there may be legal questions about all this, but let's not worry about that right now." The other thing sci-fi and tech fans may notice right away is the omnipresent-but-not-overt status of video games in this film set 15 minutes into the future. Any character in this film, when presented with the topic of gaming, treats it much the same way as someone today might talk about movies or TV. That is to say, it is both pervasive and accepted. Even Olivia Wilde's ridiculously-too-hot-for-a-blind-date character listens intently to Theodore's description of his latest gaming session and reacts with intense interest, laughter and relevant anecdotes. When was the last time you described playing a video game to someone who had never played that game, and they responded with rapt attention? Another character works in game design, and shows off a casual RPG game about trying to be the best mom in the school district. "Mom points" are awarded for things like controlling your children's behavior, cutting in line to get your kid to school first, and bribing school faculty with baked goods - all in an effort to make the other moms jealous of your mad mom skills. This is a game people would play. And it would kill in the handheld market. More importantly, however, is the main game featured in the film. Here is a key scene from fairly early in the flick (Warning: NSFW language). Did you see that? How much do you want to play that game right now? The thing is, all video game references in this movie seem like very real things that could happen to games in the near future. The future of A.I. in gaming... where do we go from here? Aside from the general advancement of game technology, there is an ever-increasing emphasis put into writing and world design and as each passing generation is exposed to games more and more, the general widespread acceptance and excitement for games can and will grow. Her is a great film, but more importantly, it has interesting things to say about where technology could take us as a society, and fun things to say about where video games are headed. 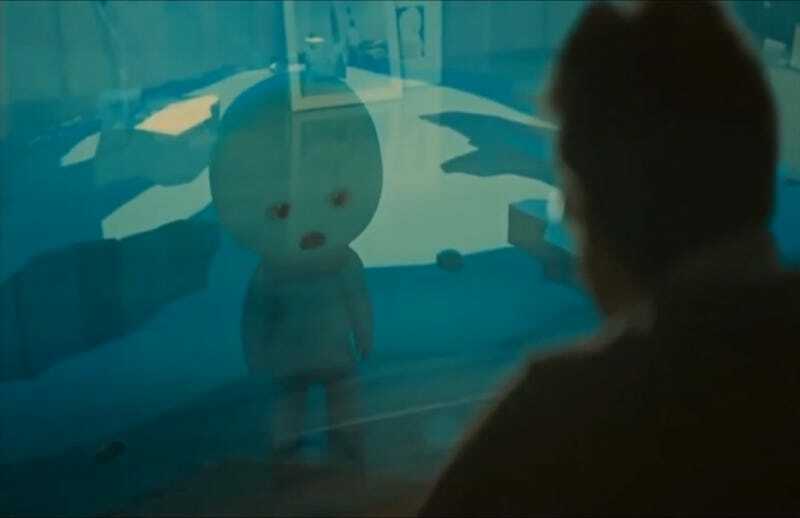 And, if you don't want to spend hard-earned cash on movie tickets or sit through a just-a-bit-over-two-hour film (or that the idea is lampoonable), feel free to watch a previous Spike Jonze joint, I'm Here, which clocks in at about 30 minutes.